Mark has a history of hypertension in both of his parents. At the age of 45, he began feeling the symptoms of hypertension as well. However, he did not mind them because he cannot afford the consultation or the maintenance medications. Years passed, and one day, while he was working at a construction site, he suddenly felt a severe headache. He is also vomiting and then became unconscious. He was brought to the emergency room of a nearby hospital, and results of the imaging studies indicate a presence of intracranial aneurysm. Hemorrhagic strokes are caused by bleeding into the brain tissue, the ventricles, or the subarachnoid space, and intracranial aneurysm is one of them. An intracranial aneurysm is a dilation of the walls pf a cerebral artery that develops as a result of weakness in the arterial wall. Subarachnoid hemorrhage results from a ruptures intracranial aneurysm. The pathophysiology of intracranial aneurysm depends on the cause and type of cerebrovascular disorder. Disruption. Normal brain metabolism is disrupted by the brain’s exposure to blood. Increase in ICP. An increase in ICP starts from the sudden entry of blood into the subarachnoid space. Injury. Compression and injury occurs in the brain tissue. Intracranial aneurysm accounts for half of the cases of hemorrhagic strokes. The mortality rate has been reported as high as 48% at 30 days after an intracranial hemorrhage. Hemorrhagic strokes account for 15% to 20% of cerebrovascular disorders and ate primarily caused by intracranial hemorrhage. Primary intracerebral hemorrhage from a spontaneous rupture of small vessels accounts for approximately 80% of hemorrhagic strokes. The cause of aneurysm is unknown, although research is ongoing. Atherosclerosis. Fatty plaques lining the blood vessels in the brain could lead to aneurysm. Congenital defect of the vessel wall. The defect has been there at the moment of birth and could cause serious intracranial aneurysm. Hypertensive vascular disease. Uncontrolled hypertension could rupture the small vessels in the brain and lead to intracranial aneurysm. Symptoms are produced when aneurysm presses on nearby cranial nerves or brain tissue. Severe headache. The conscious patient most commonly reports a severe headache. Increased ICP. An increased ICP could cause vomiting. Sudden change in the level of consciousness. As the aneurysm presses on nerves and tissues, there is a sudden early change in the level of consciousness. Focal seizures. Focal seizures can possibly occur due to frequent brain stem involvement. Nuchal rigidity. There may be pain and rigidity of the back of the neck and spine due to irritation. Visual disturbances. Visual loss, diplopia, and ptosis occur if the aneurysm is adjacent the oculomotor nerve. Primary prevention is the best approach. Hypertension. Control of hypertension, especially in people older than 55 years olds, reduces the risk. Stroke risk screenings. Stroke risk screenings provide an ideal opportunity to lower the risk by identifying high-risk individuals or groups. Education. Educating patients and the community about recognition and prevention can reduce the risk. Bleeding. Hematoma expansion is a fatal complication. Cerebral vasospasm. Cerebral vasospasm resulting in cerebral ischemia is also one of the risk factors. Acute hydrocephalus. Acute hydrocephalus results when free blood obstructs the reabsorption of cerebrospinal fluid by the arachnoid villi. Focal seizures. Seizures may occur because of extreme nerve irritation. CT scan or MRI. These studies determine the type of stroke, the size and location of the hematoma, and the presence or absence of ventricular blood and hydrocephalus. Cerebral angiography. Cerebral angiography confirms the diagnosis of an intracranial aneurysm. Lumbar puncture. Lumbar puncture is performed if there is no evidence of increased ICP, the CT scan results are negative, and subarachnoid hemorrhage must be confirmed. The goals of medical treatment are to allow the brain to recover from the initial insult, to prevent or minimize the risk of rebleeding, and to prevent or treat complications. Bed rest. Bed rest with sedation can prevent agitation and stress. Fresh frozen plasma and vitamin K. If the bleeding is caused by anticoagulation with warfarin, the INR may be corrected with FFP and vitamin K.
Antiseizure agents. Because seizures can occur after intracerebral hemorrhage, antiseizure agents are often administered prophylactically for a brief period of time. Analgesic agents. Analgesic agents may be prescribed for head and neck pain. Sequential compression devices. Sequential compression devices or anti-embolism stockings prevent deep vein thrombosis. The goal of surgery is to prevent bleeding in an unruptured aneurysm or further bleeding in an already ruptured aneurysm. Craniotomy. Surgical evacuation is most frequently accomplished via a craniotomy. Endovascular treatment. This is the surgical management for the occlusion of the parent artery. Aneurysm coiling. This is the obstruction of the aneurysm site with a coil. All patients should be monitored in the intensive care unit after an intracerebral aneurysm. Cranial nerve deficits (extraocular eye movements, facial droop, presence of ptosis). Speech difficulties and visual disturbance. Headache and nuchal rigidity or other neurologic deficits. Ineffective tissue perfusion related to bleeding or vasospasm. Disturbed sensory perception related to medically imposed restrictions. Anxiety related to illness and/or medically imposed restrictions (aneurysm precautions). Relief of sensory and perceptual deprivation. All patients should be monitored in the intensive care unit after an intracerebral hemorrhage. 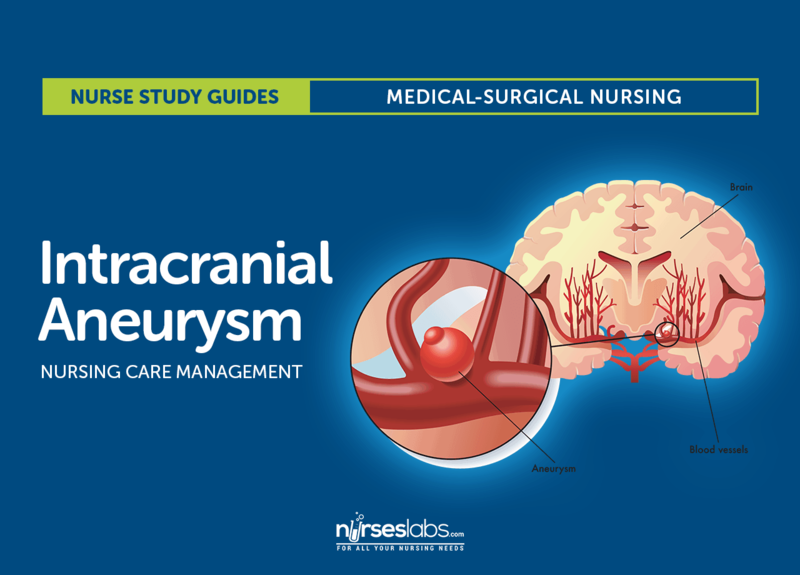 Monitor closely for neurologic deterioration, and maintain a neurologic ﬂow record. Check blood pressure, pulse, level of consciousness, pupillary responses, and motor function hourly; monitor respiratory status and report changes immediately. Implement aneurysm precautions (immediate and absolute bed rest in a quiet, nonstressful setting; restrict visitors, except for family). Elevate the head of bed 15 to 30 degrees or as ordered. Avoid any activity that suddenly increases blood pressure or obstructs venous return (eg, Valsalva maneuver, straining), instruct patient to exhale during voiding or defecation to decrease strain, eliminate caffeine, administer all personal care, and minimize external stimuli. Apply antiembolism stockings or sequential compression devices. Observe legs for signs and symptoms of deep vein thrombosis tenderness, redness, swelling, warmth, and edema. Keep sensory stimulation to a minimum. Explain restrictions to help reduce patient’s sense of isolation. Inform patient of plan of care. Provide support and appropriate reassurance to patient and family. Assess for and immediately report signs of possible vasospasm, which may occur several days after surgery or on the initiation of treatment (intensiﬁed headaches, decreased level of responsiveness, or evidence of aphasia or partial paralysis). Also administer calcium channel blockers or ﬂuid volume expanders as prescribed. Maintain seizure precautions. Also maintain airway and prevent injury if a seizure occurs. Administer antiseizure medications as prescribed (phenytoin [Dilantin] is medication of choice). Monitor for onset of symptoms of hydrocephalus, which may be acute (ﬁrst 24 hours after hemorrhage), subacute (days later), or delayed (several weeks later). Report symptoms immediately: acute hydrocephalus is characterized by sudden stupor or coma; subacute or delayed is characterized by gradual onset of drowsiness, behavioral changes, and ataxic gait. Monitor for and report symptoms of aneurysm rebleeding. Rebleeding occurs most often in the ﬁrst 2 weeks. Symptoms include sudden severe headache, nausea, vomiting, decreased level of consciousness, and neurologic deﬁcit. Hyponatremia: monitor laboratory data often because hyponatremia (serum sodium level under 135 mEq/L) affects up to 30% of patients. Report low levels persisting for 24 hours, as syndrome of inappropriate antidiuretic hormone (SIADH) or cerebral salt wasting syndrome (kidneys cannot conserve sodium) may develop. Provide patient and family with information to promote cooperation with the care and required activity restrictions and prepare them for patient’s return home. Identify the causes of intracranial hemorrhage, its possible consequences, and the medical or surgical treatments that are implemented. Discuss the importance of interventions taken to prevent and detect complications (eg, aneurysm precautions, close monitoring of patient). As indicated, facilitate transfer to a rehabilitation unit or center. The patient and the family are provided with information that will enable them to cooperate with the care and restrictions required to prepare them to return home. Causes. Patient and family teaching includes information about the causes of intracranial aneurysm and its possible consequences. Medical treatments. The patient and the family are informed about the medical treatments that are implemented, including the surgical intervention and the importance of interventions taken to prevent and improve cerebral tissue perfusion. Assistive devices and environment. Teaching addresses the use of assistive devices or modification of the home environment to help the patient live with the disability. Follow-up appointments. The patient and family are reminded of the importance of following recommendations and keeping with follow-up appointments with healthcare providers for monitoring of risk factors. Extent, nature and duration of the problem. Effects on independence and lifestyle. The initial mortality rate for an intracranial aneurysm is almost 50%. Uncontrolled hypertension causes eighty percent of hemorrhagic strokes. Numbness of an arm or leg. Severe headache helps in the diagnosis of intracranial aneurysm. Most patients with hemorrhagic strokes are placed in bed in which position? Semi-Fowler's (head of bed at 15 to 30 degrees). Most patients with hemorrhagic stroke are placed in Semi-Fowler's to prevent increasing ICP. Which of the following are possible complications of a patient with intracranial aneurysm? All of the options listed above are complications of intracranial aneurysm. A. Numbness of an arm or leg. 4. Most patients with hemorrhagic strokes are placed in bed in which position? D. Semi-Fowler’s (head of bed at 15 to 30 degrees). 5. 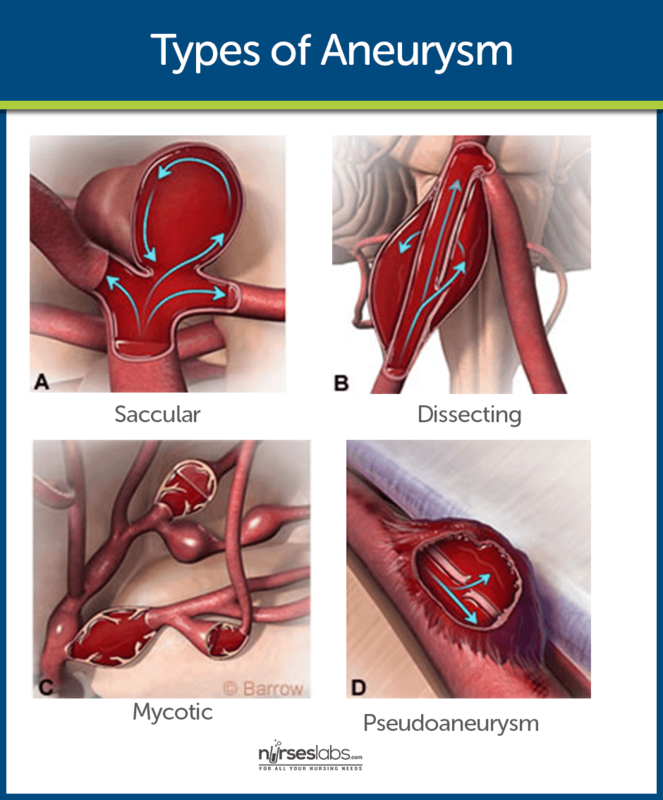 Which of the following are possible complications of a patient with intracranial aneurysm? 2. Answer: D. Uncontrolled hypertension. 3. Answer: C. Severe headache. 4. Answer: D. Semi-Fowler’s (head of bed at 15 to 30 degrees). Most patients with hemorrhagic stroke are placed in Semi-Fowler’s to prevent increasing ICP. 5. Answer: D. All of the above.